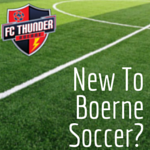 The FC Thunder Recreational Program fosters a fun, learning environment for children of all skill levels interested in learning soccer fundamentals. FC Thunder collaborates with KidSafe-approved volunteer parent coaches to concentrate on individual player skills development. Our focus is to ensure players have a soccer experience that enables them to develop fundamentals as well as an appreciation of team work and good sportsmanship in a fun environment. Our volunteer coaches are provided with a developmentally appropriate curriculum to teach from and have access to on the field guidance from both qualified Manchester School of Soccer coaches and FC Thunder staff coaches. This is all done with season long organizational assistance from FC Thunder staff and Directors to ensure we are doing everything we can for the players to learn and grow. While the soccer experience in this league focuses primarily on having fun in comparison the more competitive levels of soccer within the club, the coaching provided ensures team and coach has access to structured exercises and training sessions, which will enable players to develop and maintain a basic foundation of soccer skills. Click REGISTRATION page for registration information. Please reference the following presentation provided during the Fall 2018 Coach Kickoff Meetings (9/4/18, 9/5/18).